Cape Town – Every week, I have to come up with an idea for a column. Sometimes the idea is right there in front of me. Sometimes there are lots of ideas I just don’t want to touch. And sometimes there is nothing at all. What, I said to my husband and son, am I going to write about? Jak, 13, had an instant response: write about Magic The Gathering, he said. Magic The Gathering is his current, all-consuming obsession so his suggestion was not surprising. But it also wasn’t a bad idea. 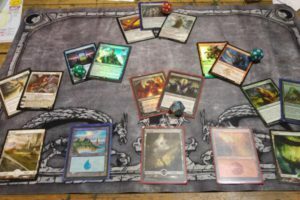 What is Magic The Gathering? When it first entered our lives, we found ourselves besieged by long, impassioned and incomprehensible explanations, frequent requests for money and many, many, many exotic looking cards scattered round the house. Over time I have penetrated the veil just a little and can report that it is a fiendishly complicated card game in which creatures, artifacts and spells are deployed to do battle based on an interaction with how many power (or “mana”) cards there are in your hand. It is also a social thing: devotees gather at venues in Claremont and Tyger Valley and take part in tournaments in which they play against each other, trade cards and buy packs of cards (that’s where the money was going). Jak’s Uncle Andrew, a geek of note, was intrigued and did some research. Very arcane, he said, rolling his eyes a little. And then one long weekend, Jak persuaded me to play a game with him. I tried and retired feeling cross and defeated and frustrated. But I cannot resist a geeky challenge and went to that source of all knowledge, YouTube. Five videos later I had a smattering of what was going on. Six months later, I have my own deck of cards, and play a game with Jak three or four times a week. I still have no idea what I am doing most of the time, and repeatedly have ask why he did what he did and what he would do if he had the cards in my hand (which I then show him). He has been very kind but had now told me sternly that he is not going to tell me what to do any more. I retreat to playing a card called Reckless Cohort, of which I am fond because I know what it does (it has to attack every time). I have won, I think, three games in those six months and I know that I don’t really constitute an adequate opponent. But I am the parent of a teenager and this is a way to keep the lines of communication open. I am going to be getting my very own deck for my birthday. I speculate on making a video series called MTG With Mom and garnering a YouTube fortune. It has also introduced us to another feature of teen parenting: the drop-off and fetch. Every Sunday, we drop Jak off (he goes in on his own to meet his friend Sean, who introduced him to MTG) and then we get phoned when he needs to be fetched. He spends the day with people we don’t really know all that well (except for Sean, of course), and takes himself off to Cavendish when he needs a snack. Only yesterday it seems he was holding my hand when crossing the road. The MTG learning curve is steep – and the parenting one is steeper.